The vitreous humor is a transparent, gelatinous mass whose main constituent is water. It plays an important role in providing metabolic nutrient requirements of the lens, coordinating eye growth and providing support to the retina. It is in close proximity to the retina and reflects many of the changes occurring in this tissue. The biochemical changes occurring in the vitreous could provide a better understanding about the pathophysiological processes that occur in vitreoretinopathy. In this study, we investigated the proteome of normal human vitreous humor using high resolution Fourier transform mass spectrometry. The vitreous humor was subjected to multiple fractionation techniques followed by LC-MS/MS analysis. We identified 1,205 proteins, 682 of which have not been described previously in the vitreous humor. Most proteins were localized to the extracellular space (24%), cytoplasm (20%) or plasma membrane (14%). Classification based on molecular function showed that 27% had catalytic activity, 10% structural activity, 10% binding activity, 4% cell and 4% transporter activity. Categorization for biological processes showed 28% participate in metabolism, 20% in cell communication and 13% in cell growth. The data have been deposited to the ProteomeXchange with identifier PXD000957. This large catalog of vitreous proteins should facilitate biomedical research into pathological conditions of the eye including diabetic retinopathy, retinal detachment and cataract. The vitreous is a highly hydrated gelatinous mass that fills the space between the lens and the retina. The vitreous is adherent to the retina diffusely though the adhesion is strongest at the anterior border of retina, the macula, the optic nerve head, over lattice degenerations and areas of scars. The major function of the vitreous is to allow light to reach the retina and maintain the shape of the eyeball. The formation of vitreous occurs in two phases. Primary vitreous is formed by the third or fourth week of gestation, when the neural ectoderm separates from the surface ectoderm. The space between the two is the future vitreous cavity. This space is bridged by fibrillar material which is thought to be collagenous in nature. By the time the fetus reaches the 10 mm stage, mesodermal cells enter the vitreous space via the fetal fissure and develop into hyaloid vessels which branch throughout the vitreous cavity . In the adventitia surrounding the vessels, there are mononuclear phagocytes and fibroblasts which are thought to later differentiate into hyalocytes. This cellular vitreous is the primary vitreous. Acellular structures begin to appear by end of the sixth week of gestation between the retina and the hyaloid vasculature. This secondary vitreous is essentially extracellular matrix consisting primarily of type 2 collagen . With the development of the secondary vitreous, the hyaloid vascular system regresses. Hyalocytes appear to be the most important cells and after birth, there is no new migration of these cells into the vitreous cortex. Thus, with an increase in globe size and vitreous cortex surface area, there is a decrease in the density of hyalocytes. Since the vitreous acts as a metabolic repository for the retina, hyalocytes and surrounding tissues , some of the proteins in vitreous humor could be contributed by these surrounding tissues. Its viscosity is two to four times greater than water, which gives it a gelatinous consistency . The human vitreous is composed of a complex network of cross-linked collagen fibres of types II, V, IX and XI of which type II is the most abundant. Non-collagenous structural proteins are less abundant as compared to collagen fibrils. Hyaluronic acid, a glycosaminoglycan is also found in abundance in the vitreous [5, 6]. A significant amount of prealbumin and transferrin in the vitreous has also been reported [7–9]. Of the soluble proteins that constitute the vitreous, sialic acid containing glycoproteins constitute the largest fraction . It is well understood that the changes occurring in the retina are closely linked to biochemical changes occurring in the vitreous humor . Vitreous humor does not have any blood vessels but is nourished by vessels of the retina and the ciliary body. As the vitreous can be easily obtained during vitrectomy surgery, studying the changes occurring in the vitreous could provide valuable information about pathological changes occurring in the retina in disorders of the eye. Many researchers have studied the proteins of the normal vitreous using different techniques and some of them have also catalogued various proteins [12–16]. Nakanishi et al., have catalogued 51 proteins in the vitreous by Matrix assisted laser desorption ionization-time of flight (MALDI-TOF) mass spectrometry . Kim et al. employed immunoaffinity depletion followed by nano-liquid chromatography-Matrix assisted laser desorption ionization (LC-MALDI-MS/MS) resulting in the identification of 346 proteins from non-diabetic controls . In a subsequent study, Gao et al. identified 252 proteins from the vitreous employing sodium dodecyl sulphate polyacylamide gel electrophoresis (SDS-PAGE) analyzed by LC-MS/MS . Aretz et al have identified 1,111 distinct proteins by employing different protein prefractionation strategies such as liquid phase isoelectric focussing, 1D SDS gel electrophoresis and a combination of both . Here, we identified 1,205 proteins of which 682 proteins have been detected in the vitreous humor for the first time. A comprehensive proteomic profiling of normal vitreous would serve as an invaluable template for future studies that focus on protein dynamics in vitreous in pathological conditions. 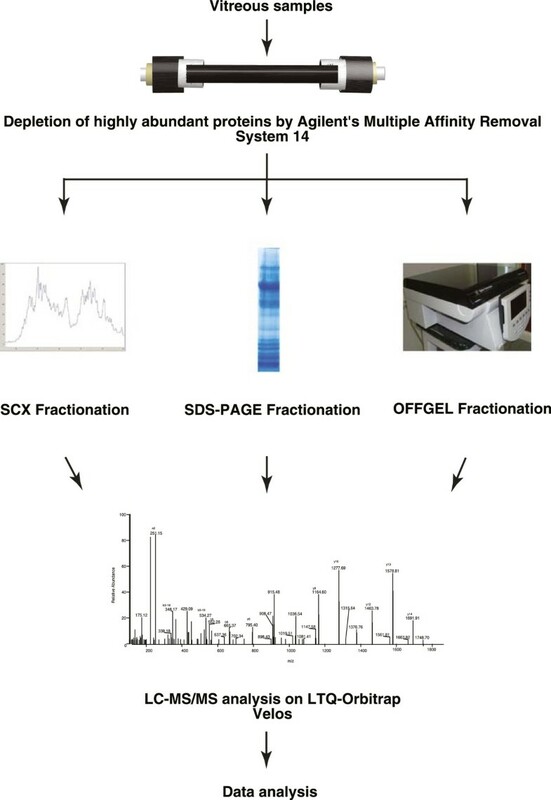 Proteomic analysis of the vitreous humor was carried out by depleting the samples of abundant proteins and subjecting it to multiple fractionation techniques, such as In-gel digestion, SCX and OFFGEL fractionation. LC-MS/MS analyses of the different fractions were carried out on an LTQ-Orbitrap Velos (Thermo Electron, Bremen, Germany) mass spectrometer. The corresponding MS data were searched using the search algorithms Mascot, SEQUEST and X! Tandem against NCBI RefSeq 59 human protein database containing 36,211 sequences with known contaminants (Figure 1). This resulted in the identification of 7,642 peptides from 1,205 proteins. A complete list of proteins identified in vitreous is provided in Additional file 1: Table S1 along with their known sub cellular localization, molecular function, biological process, domains/motifs, number of peptides and sequence coverage. Protein identifications include 41 proteins designated as ‘missing proteins’ by c-HPP and these are highlighted in Additional file 1: Table S1. A list of peptides identified from this study from all three searches is provided in Additional file 2: Table S2. When compared to previous reports, 682 proteins out of 1,205 were found to be uniquely identified in this study. A partial list of these proteins is provided in Table 1. The description of 3 novel proteins identified in this study and four previously reported proteins is provided in following sections. Experimental design for proteomic characterization of vitreous humor. Pooled vitreous humor samples were depleted of abundant proteins using Agilent’s MARS 14 column followed by in-gel digestion, in-solution digestion and OFFGEL electrophoresis. The samples were analyzed on LTQ-Orbitrap Velos mass spectrometer. Proteomic analysis of the vitreous has been carried out by many groups using different techniques as summarized in Table 2. Some of the proteins not identified in the present study in comparison to previous studies may be due to differences in sample preparation methods or mass spectrometry platforms employed. Since obtaining normal vitreous from healthy individuals is not a possibility, clinically normal appearing vitreous samples from patients undergoing vitrectomy surgery for macular hole or traumatic cataract and cataract surgery for congenital cataract were pooled for the analysis. There is a potential possibility that the vitreous proteome in some cases is influenced by associated pathology in these subjects. However, this was close to normal vitreous that we could obtain for the study. Among the identified proteins in vitreous, we found many proteins that had been previously described in the vitreous, confirming the validity of the proteomic approach undertaken by us. 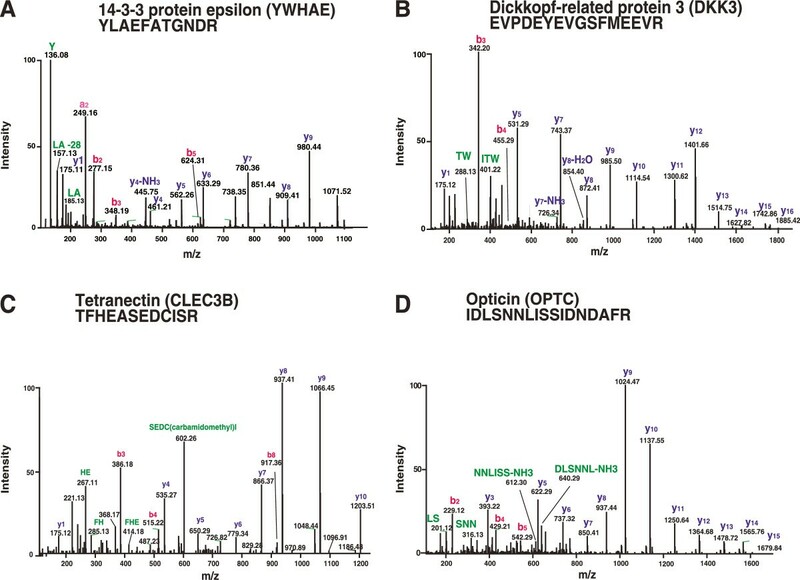 Among the proteins previously reported in vitreous are aldolase A, fructose-bisphosphate (ALDOA), cystatin C (CST3), dickkopf homolog 3 (DKK3), orosomucoid 2 (ORM2), serpin peptidase inhibitor, clade C member 1 (SERPINC1), insulin-like growth factor binding protein 7 (IGFBP7), lipocalin 2 (LCN2), TIMP metallopeptidase inhibitor 2 (TIMP2), C-type lectin domain family 3, member B (CLEC3B), lectin mannose-binding 2 (LMAN2), opticin (OPTC), serpin peptidase inhibitor clade F (SERPINF1). Representative MS/MS spectra of some identified proteins in this study are shown in (Figure 2). 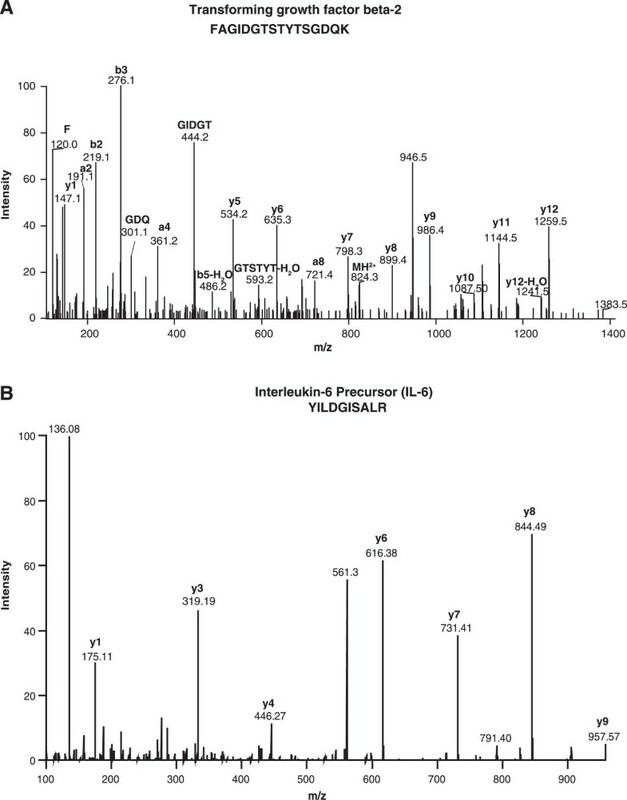 Representative MS/MS spectra of known proteins in vitreous that were identified in this study. A. peptide YLAEFATGNDR belongs to 14-3-3 protein epsilon. B. Peptide EVPDEYEVGSFMEEVR belongs to dickkopf-related protein 3. C. Peptide TFHEASEDCISR belongs to tetranectin. D. Peptide IDLSNNLISSIDNDAFR belongs to opticin. We identified several components of complement system including complement C1q subcomponent subunit A (C1QA), C1QB, C1QC, C1QL3, C1QTNF3, C1QTNF5, C1R, C1RL, C1S, C2, C3, C4A, C4B, C4BPA, C5, C6, C7, C8A, C8B, C8G, C9, CFB, CFD, CFH, CFHR1, CFHR2, CFHR3, CFI. Activation of the complement pathways can initiate and accelerate thrombosis, apoptosis and leukostasis, all of which could be important steps in the development of diabetic retinopathy . Some of the complement factors are also associated with age-related macular degeneration (AMD). Raychaudhuri et al., have shown that compromised complement factor H (CFH) function contributes to pathogenesis of AMD . CFH risk allele reveals a polymorphism representing a tyrosine to histidine change at amino acid 402, which is associated with AMD . This region of CFH is crucial for binding of heparin and C-reactive protein . Ennis et al., have also shown that SNP in complement factor 1 is associated with risk of AMD . Opticin (OPTC) is a member of the small leucine-rich repeat protein (SLRP) family. Opticin is expressed in the retina, skin, iris, vitreous humor, non-pigmented epithelium of the ciliary body, sclera, optic nerve, choroid, corneal epithelium, uveal tract and lens [25–27]. It is associated with age related macular degeneration and posterior column ataxia with retinitis pigmentosa, both of which are inherited eye diseases . Retinol-binding protein 3 (RBP3) is a soluble single subunit glycoprotein that is synthesized and secreted by rod photoreceptor cells into the interphotoreceptor matrix [29–32]. It is believed to transport all trans retinol to the retinal pigment epithelium (RPE) and 11-cis retinal from the RPE to the bleached photoreceptors, thus playing an important role in the visual cycle . A mutation in the RBP3 gene (Asp1080Asn) has been linked to autosomal recessive retinitis pigmentosa . RBP3 is known to modulate the notch signal transduction by interacting with the phosphorylated intracellular domain of the notch receptor . It is surprising that molecules such as RBP3, which appears to function at the back of the retina farthest from the vitreous, could still be found in the vitreous. The possible explanation for this could be that even though the intravascular contents are prevented from directly reaching the vitreous by the presence of the blood ocular barrier, there is no evidence of an effective barrier for proteins in the intercellular and interstitial spaces of retina and surrounding tissues. Serpin peptidase inhibitor, clade F, member 1 (SERPINF1) is a 50 kDa secreted glycoprotein and reported to be expressed in many tissue and vitreous [36, 37]. It belongs to a group of serine protease inhibitors with anti-angiogenic activities [38, 39]. SERPINF1 concentration is found to be significantly lower in the vitreous fluid of subjects with PDR [40–42]. Representative MS/MS spectra of two unique proteins identified in this study –Interleukin 6 (IL-6) and transforming growth factor beta-2 (TGFB2) are shown in Figure 3. Interleukin-6 is a cytokine released in acute and chronic inflammation. This molecule has been extensively studied as an early indicator of inflammatory disorders such as acute pancreatitis and urticaria [43, 44]. All insulin-like growth factor-binding proteins (IGFBP) are secreted and have a leader sequence. They are conserved at amino and carboxyl terminal with 18 cysteine residues. All these genes encode proteins with an IGFBP domain and a thyroglobulin type-I domain. These proteins bind to insulin-like growth factors (IGFs) I and II and are found in the plasma in the form of glycosylated and non-glycosylated forms [45–48]. IGFBP4, IGFBP6 are O-glycosylated and IGFBP5 and IGFBP6 are N-glycosylated [49, 50]. IGFBP6 is tumor suppressor,  extracellular protein  and preferentially binds to IGF-II . IGFBP2 serves as an antiapoptotic biomarker . We identified several members of the insulin-like growth factor-binding protein (IGFBP) family including IGFBP2, IGFBP4, insulin-like growth factor 2 (IGF2), insulin-like growth factor binding protein acid labile subunit (IGFALS). Other members of this family, IGFBP5, IGFBP6 and IGFBP7, have already been identified in previous studies. Representative MS/MS spectra of novel proteins identified in this study. A. Peptide FAGIDGTSTYTSGDQK belongs to Transforming growth factor beta-2 (TGFB2). B. Peptide YILDGISALR belongs to Interleukin-6 Precursor (IL-6). We compared our results with other high throughput studies on vitreous humour [13, 14, 16]. We have identified 523 proteins identified by other studies. In addition, we have identified 682 novel proteins not described in previous studies. Of the 682 novel proteins, we identified proteins such as S-Arrestin(SAG) and transforming growth factor-beta 2 (TGF-B2) which are involved in the pathophysiology of ocular diseases. S Arrestin, also known as S antigen(S-Ag) is a major photoreceptor protein. It is a member of the beta-arrestin protein family which participate in agonist-mediated desensitization of G-protein-coupled receptors. Arrestin preferentially binds light activated phosphorylated rhodopsin and prevents further signaling by direct competition with transducin, a visual G-protein . It is expressed in the retina and pineal gland. This protein is highly antigenic and has been implicated in experimental uveoretinitis. There is also recent evidence to suggest S-Ag specific T cells may be involved in the pathophysiology of Bechets disease, a chronic, relapsing, multisystem inflammatory disorder characterized by recurrent oral and genital ulcers, severe intraocular inflammation and skin lesions . Mutations in the S Arrestin gene is also associated with an autosomal recessive form of night blindness known as Oguchi disease [57–59]. Transforming growth factor-beta 2(TGF-B2) belongs to the TGFB family of cytokines. These proteins bind to their transmembrane receptors, which in turn activate their downstream effectors like SMAD proteins which are known to regulate cell proliferation, apoptosis and differentiation . Primary open angle glaucoma is a disease of the eye which is characterized by elevated intra ocular pressure due to increased resistance to the outflow of aqueous humor through the trabecular meshwork. TGF-B2 has been shown to be elevated in the aqueous humor of patients with primary open angle glaucoma. Its role in glaucoma is thought to be due to the increased production of extracellular matrix in the trabecular meshwork . A genetic defect in the gene that codes for this protein is associated with Peter's anomaly which is a congenital defect of the anterior chamber of the eye . We carried out a bioinformatics analysis of subcellular localization, molecular function and biological processes by searching the identified proteins against the manually curated Human Protein Reference Database (HPRD; http://hprd.org) and Human Proteinpedia (http://humanproteinpedia.org) [63–65]. 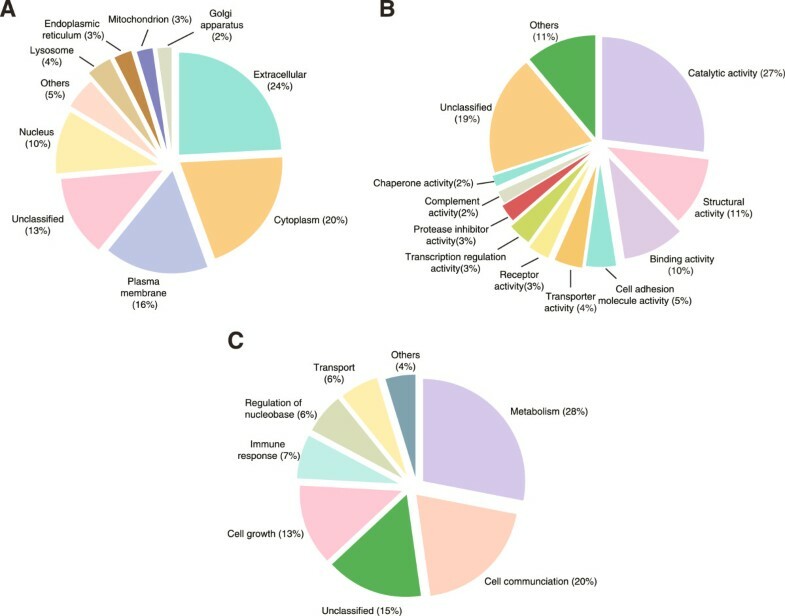 Of the 1,205 proteins identified in this study, 599 proteins possess signal peptides and 318 proteins are reported to be localized in extracellular compartment. As illustrated in Figure 4A, the majority of the proteins reported in our study were localized to extracellular space (24%), cytoplasm (20%) or plasma membrane (14%). We also classified proteins based on molecular functions and biological processes as shown in Figure 4B, C. Classification based on molecular function showed that the large majority of the proteins are involved in catalytic activity (27%), structural activity (10%), binding activity such as calcium ion binding, receptor binding and complement binding (10%), cell adhesion molecule activity (4%), and transporter activity (4%). A large group (19%) of proteins are still unclassified in terms of their molecular function. Further categorization was done for biological processes which constitute metabolism (28%), cell communication (19%), cell growth (12%), and immune response (7%). Subcellular localization and functional annotation of proteins identified in vitreous humor. A. Gene Ontology analysis for subcellular localization of identified proteins. B. Molecular functions of identified proteins. C. Biological processes of the identified proteins. The data regarding proteins was obtained from Human Protein Reference Database (HPRD: http://www.hprd.org). Our study provides a comprehensive proteomics profile of the human vitreous humor. Many of the pathologic changes occurring in the retina are likely to be reflected in the vitreous because of its close proximity to the retina and also because of the breakdown of the blood retinal barrier. Hence, a proteomic study of the vitreous in related retinal diseases such as diabetic retinopathy, retinal detachment and central or branch retinal vein occlusions would provide valuable insights about the pathophysiology of these diseases. The information from our study could serve as a baseline for future studies especially those aimed at identifying biomarkers for retinal disorders. The vitreous samples for the proteomic analysis were obtained from five patients undergoing vitrectomy for macular hole, three patients with congenital cataract who underwent cataract surgery with intra-ocular lens implantation and primary posterior capsulotomy and two samples from patients with traumatic cataract with undisturbed vitreous and intact lens capsule but who also needed vitreous surgery due to zonular damage. All samples were collected by pars plana vitrectomy, were centrifuged at 13,000 rpm at 4°C for 15 minutes and archived at −80°C until further use. Informed consent was obtained from all the subjects and the research adhered to the tenets of Declaration of Helsinki. The study was approved by the Ethics committee “Science for Health” under the approval number 20080713/SFH-014/010. Pooled samples were concentrated by 3 kDa filter through low-adsorption membranes (Amicon, Milliore, Billerica, MA). Protein estimation was carried out for pooled concentrated sample using Lowry’s assay (BioRad Laboratories). A total of 4 mg protein was subjected to Agilent’s Multiple Affinity Removal System 14 (MARS 14) for depletion of abundant proteins. MARS 14 column is routinely used for depletion of abundant proteins in serum/plasma. This step allows us to deplete highly abundant albumin, IgG, transferrin, heptoglobin, IgM, IgA, fibrinogen, alpha antitrypsin, apolipoprotein A1, alpha 1 acid glycoprotein, alpha2 macroglobin, transthyretin, complement C3 and apolipoproteins. We had to optimize our procedures for depletion of abundant proteins from vitreous humor. For each depletion cycle, Agilent recommends 20 μl of serum that is approximately equivalent to 1 mg of total protein. During depletion of abundant proteins from vitreous, we also used 1 mg of protein for each depletion cycle. As we had 4 mg protein, we carried out 4 independent depletion cycles and pooled the flow through fractions. After passing the vitreous sample through MARS 14 column, 460 μg of protein was recovered in the flow through and the remaining 3.54 mg of protein accounted for the bound fraction. 60 μg of depleted vitreous sample was resolved on SDS-PAGE and subjected to in-gel digestion prior to mass spectrometry analysis. The remaining 400 μg of protein was reduced (5 mM DTT), alkylated (20 mM iodoacetamide) and digested using trypsin 1:20 w/w (Promega, Madison, WI) overnight at 37°C. The samples were acidified by adding 20% trifluoro acetic acid (TFA) to a final concentration of 0.1% and desalted using C18 macro-spin columns (Harvard apparatus, catalog no. 74-4101). 200 μg peptide digest was used for SCX fractionation as well as OFFGEL fractionation. Sixty micrograms of depleted vitreous sample was resolved by SDS-PAGE and stained using colloidal Coomassie stain. The lane was excised into 16 pieces and destained with 40 mM ammonium bicarbonate in 50% acetonitrile (ACN). Trypsin digestion was carried out essentially as described previously [66, 67]. Briefly, reduction was carried out using 5 mM dithiothreitol (DTT, 60°C for 45 minutes) followed by alkylation using 20 mM iodoacetamide (room temperature for 10 min). Sequencing grade modified porcine trypsin (Promega, Madison, WI, US) in ammonium bicarbonate was added to the gel pieces at 4°C and incubated for 45 minutes. Excess trypsin was removed and the gel pieces were immersed in ammonium bicarbonate and incubated overnight at 37°C. The peptides were extracted from the gel bands using 0.4% formic acid in 3% ACN twice, once using 0.4% formic acid in 50% ACN and once using 100% ACN. The extracted peptides were dried using speedvac and stored at -80°C until LC-MS/MS analysis. The peptide digest equivalent to 200 μg was reconstituted with 10 mM potassium phosphate buffer containing 30% ACN, pH 2.7 (solvent A). SCX fractionation was carried out using Polysulfoethyl A column (PolyLC, Columbia, MD) (300 Å, 5 μm, 100 × 2.1 mm) using an Agilent 1200 HPLC system (Agilent Technologies, Santa Clara, USA) containing a binary pump, UV detector and a fraction collector [68, 69]. The peptides were eluted using a linear salt gradient (0 to 35%) of solvent B (10 mM potassium phosphate buffer containing 30% ACN, 350 mM KCl, pH 2.7) at a flow rate of 200 μl/min. The fractions were completely dried and reconstituted in 0.1% TFA. They were desalted using stage-tips and dried on speedvac. The peptide digest equivalent to 200 μg in-solution digest was used for OFFGEL fractionation [70, 71]. Agilent 3100 OFFGEL fractionator (Agilent Technologies, Santa Clara, USA) was used for pI based separation of peptides. As per the protocol, peptides were separated using pH 3-10 Immobilized pH gradient (IPG) strip, 13 cm. The peptides were focused at 50 kVh with maximum current of 50 μA and maximum voltage set to 4000 V. Twelve fractions were collected and acidified to obtain a final concentration of 0.1% TFA prior to sample cleaning using stage-tip protocol . LC-MS/MS analyses of the samples were carried out using high resolution Fourier transform mass spectrometer, LTQ-Orbitrap Velos (Thermo Electron, Bremen, Germany). The mass spectrometer was interfaced with a nano-LC system to a trap column (2 cm × 75 μm, C18 material 5 μm, 120 Å) and an analytical column (10 cm × 75 μm, C18 material 5 μm, 120 Å). Electrospray source was fitted with an 8 μm emitter tip (New Objective, Woburn, MA) and was applied a voltage of 2000 V. Peptide samples were loaded onto trap column in 3% solvent B (90% ACN in 0.1% formic acid) and washed for 5 minutes before peptide elution using a gradient of 3-35% solvent B for 60 minutes at a constant flow rate of 0.4 μl/min. Xcalibur 2.1 (Thermo Electron, Bremen, Germany) was used for data acquisition. The MS spectra were acquired in a data-dependent manner targeting the twenty most abundant ions in each survey scan in the range of m/z 350 to 1,800. Precursor ions selected for MS/MS fragmentation were dynamically excluded for 30s. Target ion quantity for FT full MS and MS2 were 5 × 105 and 2 × 105 respectively. Higher-energy collisional dissociation (HCD) was used for precursor fragmentation. MS and MS/MS data were acquired at a resolution of 60,000 and 15,000 at 400 m/z, respectively. Internal calibration was enabled using polydimethylcyclosiloxane (m/z, 445.1200025) ions and lock mass was used for accurate mass measurements. Mass spectrometry data was processed using the Proteome Discoverer software (Version 1.4.1.14, Thermo Fisher Scientific, Bremen, Germany). Mascot, SEQUEST and X! Tandem search engines were employed to maximize the peptide identification. The mass spectrometry data was searched against NCBI RefSeq 59 human protein database containing 36,211 sequences with known contaminants. Carbamidomethylation of cysteine was used as the fixed modification and oxidation of methionine and protein N-terminal acetylation as variable modifications. Peptide mass and fragment mass tolerance were set as 20 ppm and 0.1 Da, respectively with 1 missed cleavage. Peptide identifications were filtered by setting 1% target false discovery rate (FDR). Subcellular localization, molecular function and biological process of identified proteins were analyzed using gene ontology (GO) compliant databases - Human Protein Reference Database (HPRD: http://www.hprd.org) and Human Proteinpedia [63, 73]. The raw data obtained from vitreous proteome are submitted to public data repositories. The peptide identifications and MS/MS spectra are available on Human Proteinpedia , (https://www.humanproteinpedia.org) as accession number HuPA_00682. The mass spectrometry proteomics data have been deposited to the ProteomeXchange Consortium  via the PRIDE partner repository with the dataset identifier PXD000957. Krishna R Murthy, Renu Goel contributed equally to this work. We thank the Department of Biotechnology (DBT) of the Government of India for research support to the Institute of Bioinformatics, Bangalore. Nandini A. Sahasrabuddhe and Harrys K.C. Jacob are recipients of Senior Research Fellowship from the Council for Scientific and Industrial Research (CSIR), India. Srikanth Srinivas Manda is a recipient of Senior Research Fellowship from University Grants Commission (UGC), India. Rakesh Sharma is a Research Associate supported by DBT. Harsha Gowda is a Wellcome Trust/DBT India Alliance Early Career Fellow. Dr. T. S. Keshava Prasad is the recipient of a research grant on “Development of Infrastructure and a Computational Framework for Analysis of Proteomic Data” from DBT. All authors have expressed no conflict of interest. KRM, PRM, HG, TSKP and AP conceptualized and designed the study. KRM and PRM provided the samples. KRM, RG and HKCJ contributed to sample preparation. NAS and RS performed the mass spectrometry experiments SMS, YS, AHP and A Parashar contributed to data analysis. KRM and RG wrote the manuscript. KRM, BGN, VK, TSKP, HG and AP designed the experiments, supervised the experiments and data analysis and critically reviewed the manuscript. All the authors have read and approved the final manuscript.